Merrimack Valley Hope Mission, the Newburyport Salvation Army, NCR Bus and Anna Jaques Hospital and volunteers are working together to provide a turkey dinner on Thursday, February 21, 2019. Those who would like a free hot meal are welcome to join us at the Newburyport Salvation Army located at 40 Water Street. We are that you arrive at 5pm. Merrimack Valley Hope Mission is preparing enough food to serve approximately 150 meals. This meal would not be possible without the help and support from Anna Jaques Hospital and helping Merrimack Valley Hope Mission cook all the turkeys needed for this dinner. We are also great appreciative of NCR for donating a bus which will allow us to have a shuttle doing pick ups at Park Circle, the Heritage House, the Sullivan Building, and the James Steam Mill Building. The shuttle starts at 4pm and we asked everyone who would like to use the shuttle to be ready by 4-4:15pm beginning at Park Circle. Residents should wait inside the lobby by 4 pm at all stops and a volunteer will visit each the lobby to alert residents that the bus has arrived. The bus will start at Park Circle and proceed to: Heritage House, Sullivan Building, James Steam Mill then onto the final destination of the Newburyport Salvation Army. Bus will make a return trip following dinner. We are asking those who are looking for a ride to reserve their seat by calling 978-308-9186 and leaving us a message. Merrimack Valley Hope Mission is also seeking help from volunteers and donations as well to help make this event a success. If you would like to volunteer or make a donation to the event please contact please call, text or email Don Jarvis at jarvis.don@gmail.com or (978) 914-8720. The Merrimack Valley Hope Mission (MVHM) is a group of committed volunteers who perform missions on behalf of homeless and housing insecure individuals. Their various missions support numerous local nonprofit organizations devoted to homelessness, women in recovery, and foster children and are supported by dozens of caring individuals, families, groups, businesses, non-profit organizations, schools, and churches. MVHM is collectively devoted to improving the lives of those in need and provide food, water, clothing and personal essentials on a continuous basis throughout the year. The work is street-based outreach — they “meet people where they are”. All donated items are delivered directly to people who live outdoors or spend a great deal of time outdoors, which defines our initiatives as unique and actionable forms of compassion. For more information, join the Facebook group at http://www.merrimackvalleyhopemission.org. Currently I am working on that I’m looking for advice, and guidance on. I’m in a bit of jam and would greatly appreciate anyone interested in helping or have ideas please feel free to share. In 2017 I started a volunteer group called Preserving Newbury, and last year we started a Community Flag Retirement Box which is located at the Byfield Fire Department. The high volume of flags the box continues to collects got me thinking – where are people replacing their flags? Why can’t they do it right here at the same time when they retire their flag? (FYI – several thousand flags have been connected at this location since 2016). I tossed around this thought to a few people and then the idea came up of taking an old newspaper vending machine and converting into selling American Flags. So I reached out to the Daily News of Newburyport and explained to them the idea and within a few weeks they had an old newspaper box for the project. Currently there is a bit of a learning curve that I am stuck on, and I’m hoping I can reach and connect with the right people to help and assist. These newspaper box were meant to accept change – I need to be able to have the ability to take payments larger then a few dollars and still have the ability to unlock the box. I have a few ideas on what a “P.O.S – Point of Sale” could look like for the box, but it’s beyond my knowledge on how to make it work. If someone is interested in helping with this piece please let me know. There are some people who I’ve been suggested to connect with and am working on connecting with them, but I feel the more people working on this the better the suggest. In regards to where this vending machine will be placed, I have spoken with the Newbury Fire Chief about placing it next to the flag retirement box at Byfield Fire. He will be bringing the discussion before the board at the department for a vote and discussion. However, I would like to have and see more then one those out in the community in highly visible and trafficked locations. I’ve been eyeing possible locations Newburyport, Amesbury, and Haverhill while I have been out driving around. With regards to the flags, the cost, and the profits. I have been talking with the flag company I use to purchase the grave marker flags that go out for Memorial Day. What I am going for is American Flags that are full size (4’ x 6’ or 5’ x 8’), embroidered, and packaged individually in boxes (which will allow them to be stacked in the vending machine respectfully. Yes, all the flags will be Made in America – just like the flags we place at the veteran graves in Newbury. We are currently looking at purchasing our American flags from MassCOR – the flags would be made here, in Massachusetts through a rehabilitation program offered by the Department of Corrections. My goal is to keep the cost of the flags around the same price you would pay for them at the store. So it’s fair and reasonable. All proceeds from the sales of the flags would go and support the care of veteran graves. Which would only need to cover the cost of supplies as the work itself would be done by volunteers. Who have been properly taught and trained by the guidelines Preserving Newbury was taught from Historic Gravestone Services. I am currently looking to partner up with a veteran organization (501c3) on this project and I have already started talking with a organization about this project. I feel this vending will be a great way to honor our veteran’s and our flag. The flag they once protected, now protects them and cares for them as they once cared for the flag. Each vending machine would be in honor and memory of a veteran killed in action. For the 3rd in a row Don’s community group ‘Preserving Newbury’ will be working with Triton’s Football and Soccer team. 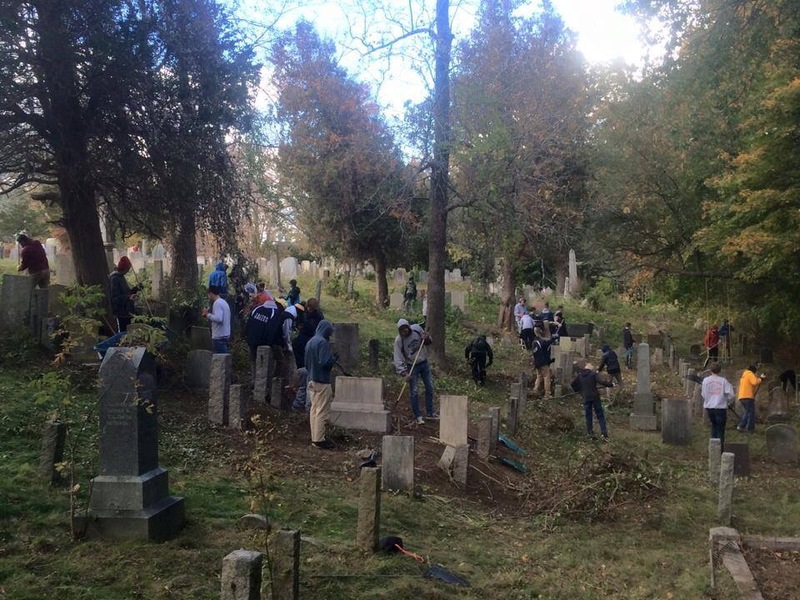 Every year Preserving Newbury can be found working in cemeteries making sure the veterans graves look great for Veterans’ Day and Wreath Day in December. The last couple of years these young athletics from Triton have done community service at the First Parish Burying Ground. Their day generally consisted of raking, clearing brush, pull weeds and basic lawn care maintenance. This year Preserving Newbury will be teaching these students the art of cleaning gravestones. Earlier this year Preserving Newbury was taught by a professional Ta Mara Conde from Histroic Gravestone Services on how to clean gravestones. These students will learn the same techniques. October 8, 2017 marked the 50th year anniversary of the passing of Sgt. Donald Wilkinson, a Newbury resident and Vietnam Veteran. On this day there was a dedication ceremony at the Plum Island Bridge.